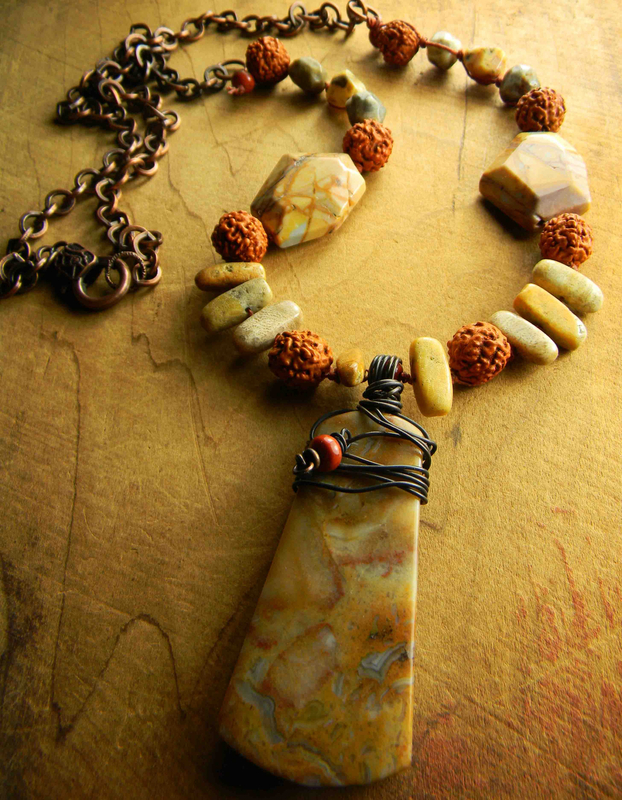 A trapezoid shaped pendant of crazy lace agate is the focal point in this boho style necklace design. Wrapped with copper wire with an accent of red jasper and a tiny copper dangle, the pendant is striking and rich in color. 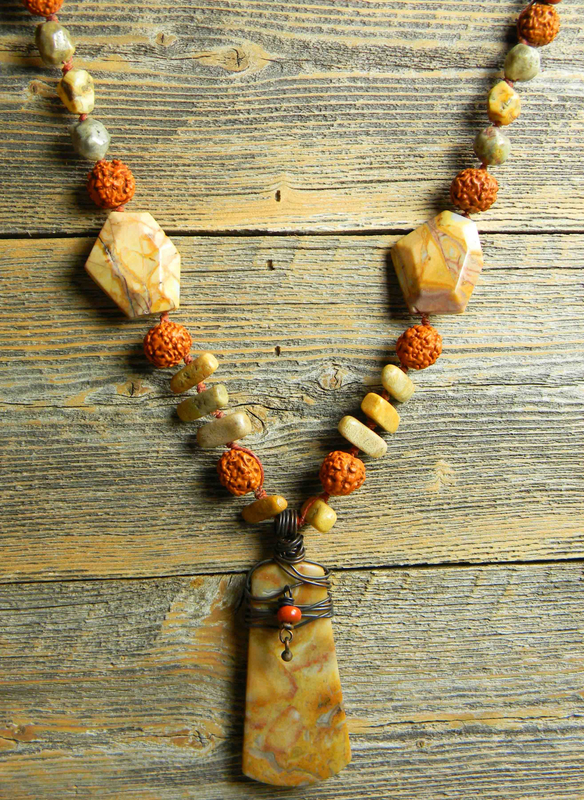 The yellow tones of the pendant are carried through the design with fossil coral stick beads, and Venus jasper freeform and nugget beads. Dark red waxed Irish linen cord joins the beads, and the color is repeated in the knobby lotus seed beads that tie the reds together. Antiqued copper rings, chain and lobster clasp add the right metal contrast to the piece. 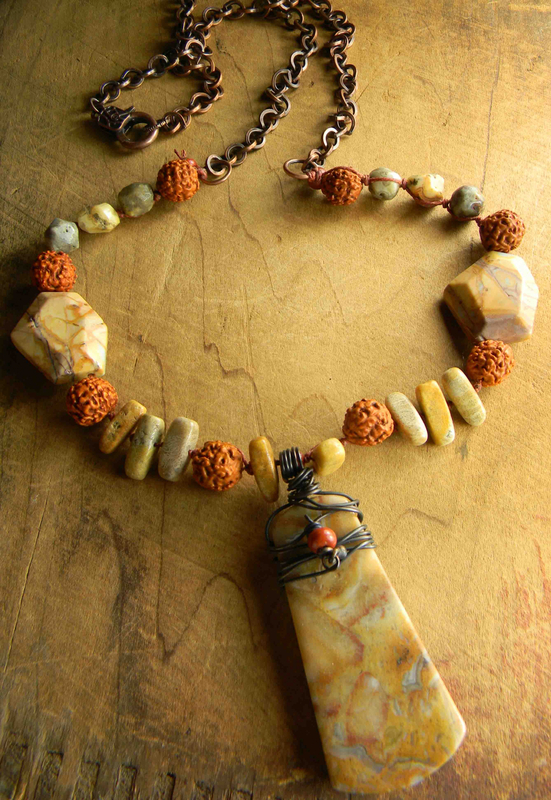 This casual style, extra long necklace measures 30 inches, plus 3.5 inches for the pendant drop. There is ample chain for length adjustment if you desire. Your package will come gift wrapped in environmentally friendly materials. All my jewelry is 100% workmanship guaranteed. Any problem with construction or component failure within one year (under normal wear conditions) will be corrected at no charge to you. No returns please, unless you have received a return merchandise authorization. All images are the property of Gloria Ewing.